Hello there! Today I thought I would do something different. I have 2 looks to share that are more of costume ideas for Halloween. Meaning you could be these characters or you could wear them to go with your costume. Wait thats basically the same thing isn't it? Oh well! These could be Halloween or not so lets just take a look! So first up I am using Pretty Beautiful Unlimited Luna to take Hello Kitty into space. Soon as I put on this polish for THIS post I knew I had to do something space related. Due to the fact I'm so over doing galaxy nails I thought lets make it a bit more than a galaxy mani. Which then I started thinking about the fact that I had never done Hello Kitty nails so I looked up Hello Kitty Astronaut and apparently it is a thing. So that led to me painting her in a space suit because logically that was the best option right? LOL! Yeah no clue why that idea came to mind let alone was a real thing! Haha! Next up I had on Celestia from the same polish collection, and this blue just said Cinderella when I had it on. I mean doesn't that blue say that to you? So then instead of googling like I did for Hello Kitty I ended up on Pinterest and came across Coewless amazing Cinderella nails from awhile back and re-fell in love with them. They are seriously amazing. I couldn't get a link over to them for some reason, so hopefully you know them! Anywhoooo, I loved them just as much as when she posted them. I thought to myself, there is no way I can do that, so I kept on scrolling. I came up with a few ideas but my mind kept drifting back to the look done by Coewless, so I went for it. After doing that I have again come to the conclusion that I should not try to redo such amazing manis because they just fail! LOL! So the idea is here but I'm not 100% happy with the full mani. I love the ideas, the colors, oh and the clock but I am my own worst enemy and I'm not crazy about the head... That being said from a distance I am ok with them! Weird I know, but hopefully you guys like them! Hope you enjoyed both of these manis. Which was your favorite? Do they work with your Halloween plans? Aw well thank ya! It was fun to do! Thanks, and I'll just sit over here with my jaw dropped at that stamping skill because no matter what I do I can't pull it off! LOL! How fun! The galaxy one is so pretty! Both are really good but that hello kitty! Thank you!! It was nerve wrecking and fun! Hello Kitty in space is so dang cute! You had me at Hello Kitty. Who knew Hello Kitty Astronaut was a thing?? They're both pretty but Hello Kitty in Space? Yes, please. 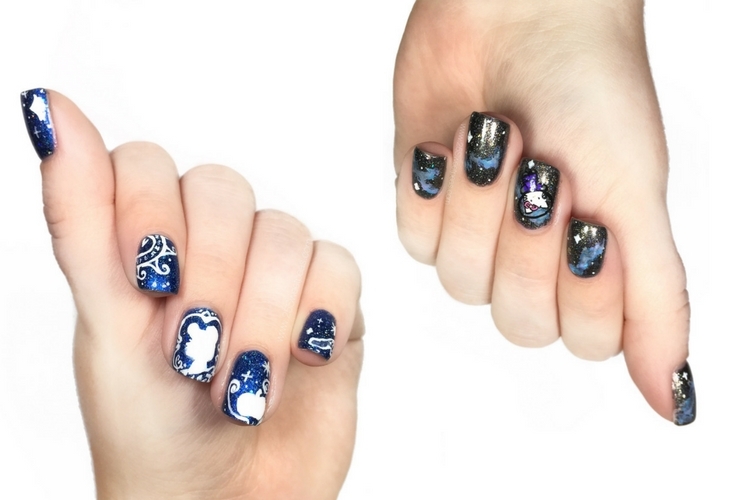 Your Cinderella manicure is breathtaking! !